“Rockin all Over the World”, our Flashback Friday is a tribute to Rick Parfitt who sadly died on Christmas Eve. 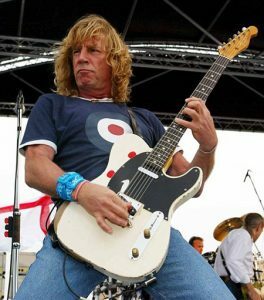 It was with a certain amount of shock that we heard about the news of the death of legendary Status Quo guitarist Rick Parfitt on Christmas Eve. Parfitt had been plagued by ill health over the last few years recently pulling out of the Status Quo tour following a heart attack. However, he sadly died following complications associated with a pre-existing shoulder injury. It is therefore only fitting that our Flashback Friday should be a tribute to Rick Parfitt. “Rockin All Over the World” was a cover of the 1975 song by written John Fogerty of Creedence Clearwater Revival fame. Status Quo recorded a much heavier version of the song for their tenth studio album “Rockin all Over the World” which was released in 1977. When the single “Rockin all Over the World” was released the song reached number 3 in the UK singles chart. However, for most of us this song is more associated with Live Aid, the 1985 Concert in aid of the famine in Ethiopia. The first band to take the stage at Wembley was Status Quo and the song they started their set with was, rather aptly, Rockin all Over the World. The song set the scene for what was to be a monumental day of live music and cemented the reputation of Status Quo as one of the UKs best live rock bands. Although largely ignored and much maligned by the music world “The Quo” had a global following and enjoyed a longevity that eluded other bigger name bands. Amongst their many successes and perhaps the one that highlights their longevity was when they recently passed the milestone of 500 weeks in the UK album chart. This is a milestone that only a handful of musicians have ever achieved. So as a tribute to Rick Parfitt our Flashback Friday is “Rockin all Over the World” by Status Quo.